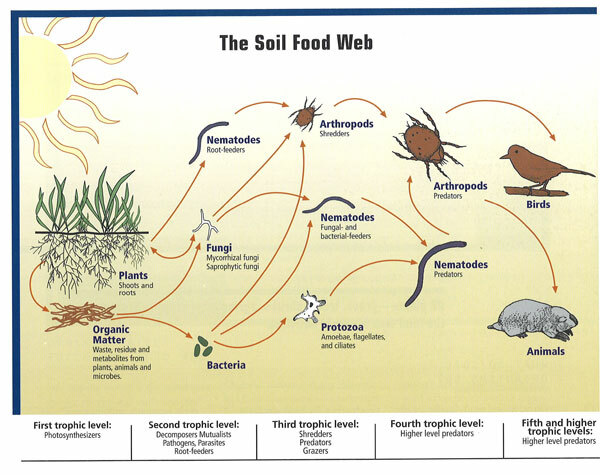 "Feed the Soil to Feed the Plants"
The Soil Food Web is the basis of soil fertility in organic gardening and farming. Organic gardening relies on the interconnected web of soil organisms—from bacteria and fungi to protozoa, microarthropods, and earthworms—to supply nutrients to your vegetables. © 2000Elaine R. Ingham, et.al. Avoiding toxic chemicals. Pesticides, fungicides, herbicides, and nitrate salt fertilizers simplify ecosystems, favoring pests and plant diseases that are generally weak competitors in a diverse, natural ecosystem. Even the “inert” carrier oils in these sprays can wipe out many species of beneficial fungi, which compete with pathogenic fungi that can infect plants. Nitrate fertilizers cause earthworm populations to dive—quite literally—as they try to get away from the irritating salts. Increasing the organic matter in the soil. Adding good garden compost, animal manures, or organic soil amendments like alfalfa meal creates a bacterial and fungal population boom, and organisms all the way up and down the soil food web benefit from this increase. See Improving Garden Soil for more information. People think of plants as passive things, rooted to the spot and there to be eaten by whatever herbivore happens upon them, whatever insect flies in or crawls up their stem, or whatever spore falls onto their leaves. Plants are hardly passive, but they are subtle. Plants synthesize chemicals to make themselves unpalatable to insect pests, or sicken herbivores that eat too many leaves. This is why plant vigor is the first defense against garden insect pests. Large, robust vegetable plants put off insect pests—they’re able to synthesize more of these off-putting chemicals than smaller, weaker plants. Plants are also exceptional at recruiting microbial allies. They do this by pumping a steady stream of sugars, simple starches, and amino acids out onto their leaves, and into the soil surrounding their roots. Why do plants “invest” 20-70% of the energy they get from the sun in freebies for the ecosystem? Leaves are coated with innocuous or beneficial bacteria, and plant roots are completely encrusted with bacteria and symbiotic fungi. Disease organisms have to fight their way through the crowd at the trough to infect leaves and roots. And some in the crowd are predators. Many of these recruits produce chemicals that put off pests, or release growth hormones that increase the growth of your vegetables. On leaves, high bacterial populations—and diversity—inhibit insect pests, which show a preference for leaves with lower bacterial densities. 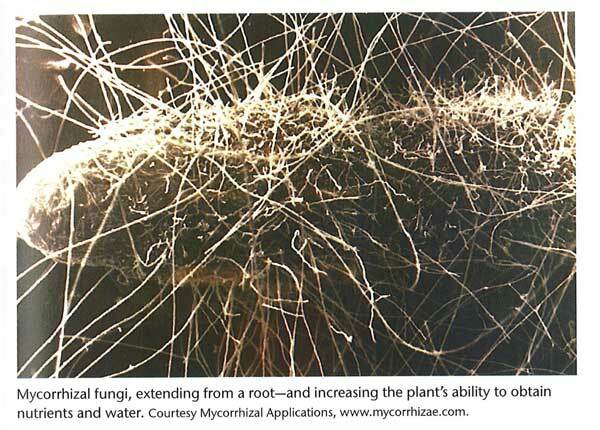 Because of these root exudates, the Rhizosphere—the zone of soil within 1-2mm of plant roots—is the most diverse ecosystem on the planet. Plants secrete sugars, simple starches, and amino acids into the soil solution around their roots. In addition, as roots grow, they slough off the outer layers of cells, which become fodder for the soil food web surrounding the roots. Populations of bacteria multiply, myccorhizal spores germinate and infiltrate the roots, and the roots become completely encrusted with bacteria and beneficial fungi. As the numbers of bacteria grow and mycorrhizal hyphae spread into the surrounding soil, soil predators increase in response to increasing prey populations. Protozoa—amoebas, paramecia, rotifers, flagellates—graze along the edges of these encrusted roots. Larger predators like nematodes and earthworms move through the soil, feeding on the bacteria, fungi, and protozoa around the roots. On the soil surface, microarthropod “shredders”—like orabitid turtle mites—skeletonize fallen leaves, shredding them into smaller pieces that bacteria and fungi in the soil can use for food. Springtails feed on the fungi, and red compost worms (Eisinea foetida) feed on fungi, bacteria, nematodes, and protozoa in the soil food web. Every time a member of the soil food web urinates or defecates, your vegetables get a micro-burst of fertilizer, right at the root hairs of your plants. Yes, the amounts are tiny, but the numbers are vast. Billions of transactions every day. All organisms have a characteristic carbon-to-nitrogen (C:N) ratio. Mammals, birds, reptiles, and all higher organisms have a C:N ratio around 30:1. For every atom of nitrogen in their tissues, they have 30 atoms of carbon. Organisms at the bottom of the soil food web—bacteria and fungi—have proportionally more nitrogen. Bacteria have a C:N ratio of 5:1—they’re 20% protein. Fungi have a C:N ratio of 12:1. It’s a basic principle of ecological stoichiometry that organisms assimilate carbon and nitrogen from their diet in roughly the same proportions as their tissues contain these elements. Any excess nitrogen is excreted back into the environment. Bacteria, with a C:N ratio of 5:1, have more nitrogen than any other organisms. They’re like billions of microscopic bags of fertilizer around your vegetable roots. When a higher organism eats a bacterium, the excess nitrogen is released back into the environment in plant-available form. Have a question or comment about what you just read? Leave me a comment in the box below. to learn about additions to the site.